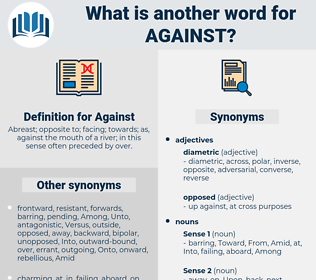 What is another word for Against? Abreast; opposite to; facing; towards; as, against the mouth of a river; in this sense often preceded by over. Criteria, assess, heads, roma, opposite. abstentions, dissidents, rejects, amendments, exhibitions, Measures, practices, aims, Nays, Has, refuses, expresses, balances, remarks. Resisted, Fought, Disagreed, Protested, Attacked, constituted, condemned, rejected, Inflicted, outnumbered, said, Urged, imposed, Sued, Refused, Objected, objects, shot, showed, fired, led, Did, Got. stopping, discouraging, Contesting, Defeating, Assaulting, Battling, challenging, Mitigating, Obstructing, condemning, Rejecting, Charging, raging, halting, badmouthing, Reversing, redressing, Bothering, Treating, breaking, feeding, playing, Proving. Resisted, Protested, Challenged, rejected, Urged, Objected, objects. combats, contravenes, Violates, afflicted, damages, undermines, states, provides, Does, Hates, rejects. 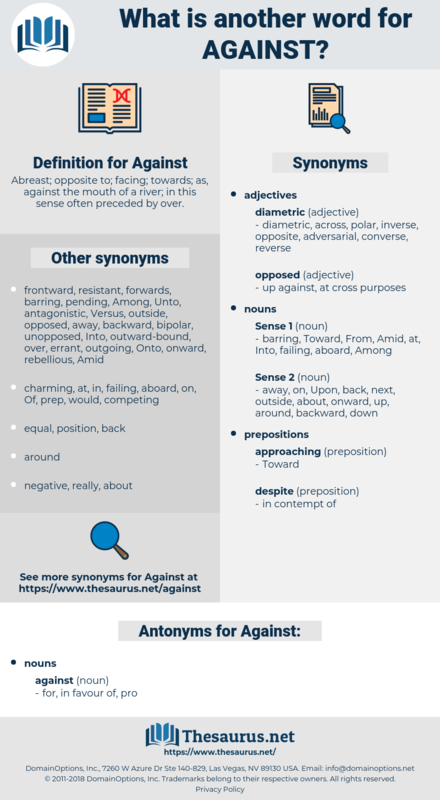 pro, for, in favour of. What chance has he against these?